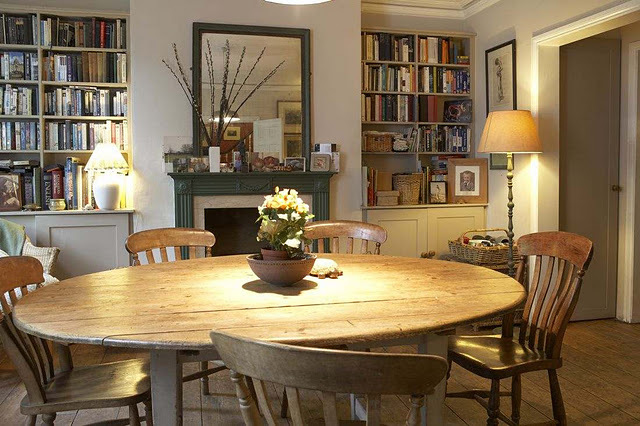 I've been looking for over a year for a drop leaf table in a French wash to no avail, however, just prior to Christmas I found a lovely antique pine table at Yvonne Saunders Antiques. The table was a perfect size but unfortunately didn't have the French finish I'd hoped for. After doing a lot of research I took myself off to Porters paints in Auckland to find out about their French wash which I heard was the easiest way to achieve the look yourself. 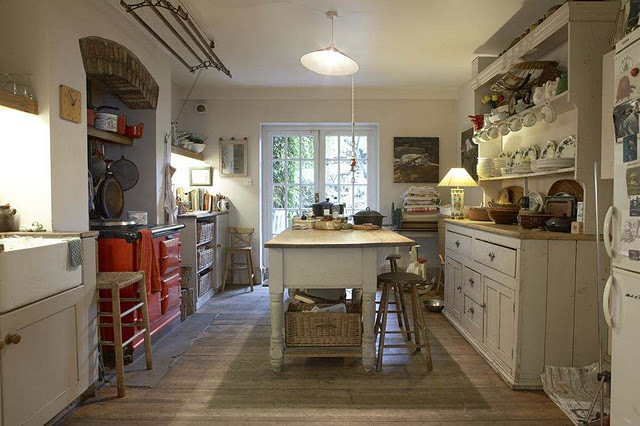 Porters Paints helped greatly with selecting my paint colour, the type of finish I would require and how to apply it, they even mixed a special colour for me as I wanted a slightly greyer look than the ready made mixes available. Basically they can mix and match any colour or swatch you take in. I have endeavoured to put together some simple step by step instructions to achieving this look. Sand and prepare the areas you are going to apply your wash. I had to completely replace some of the moulding on one of the legs as it has been chewed away by some animal. I used an epoxy putty (you can see it in white). 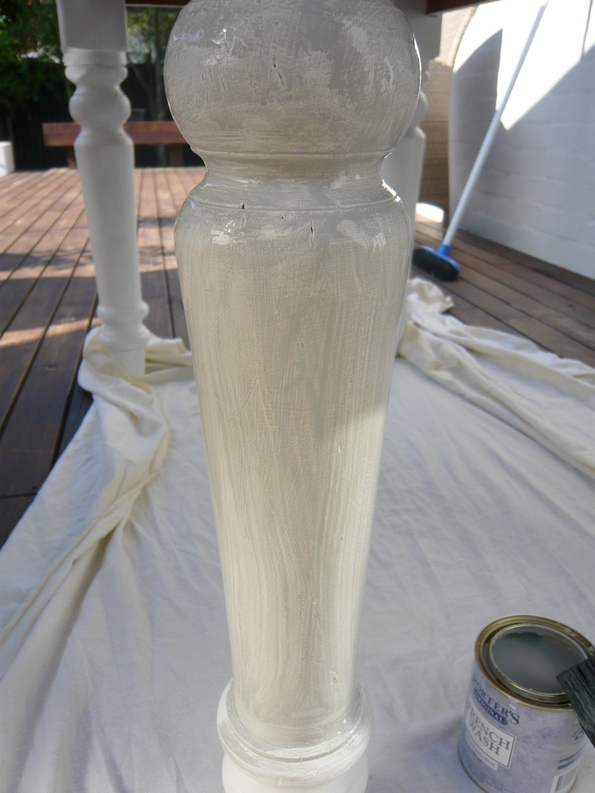 As the pine had not been painted before I simply gave it a light sanding after repairing the one leg. 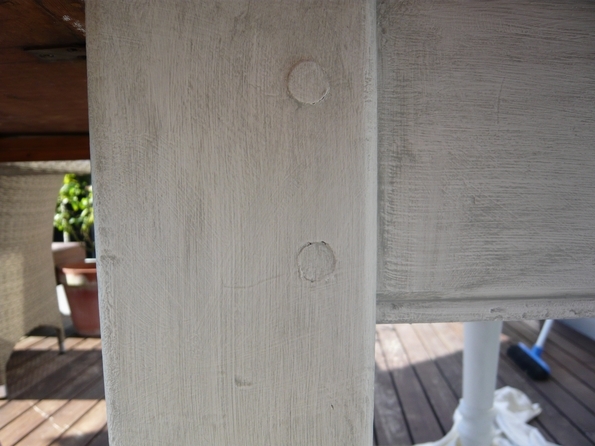 I also filled any chipped areas with wood filler and sanded these too. 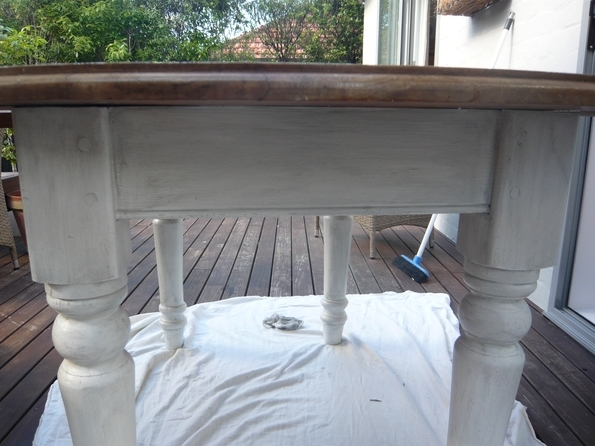 My table all prepared for it's undercoat, 2 coats of Porters low sheen acrylic (I used snow white). I applied the paint with a 2.5" flat bristle brush with random strokes, you don't want perfect strokes as the texture of the paint will help you achieve the French look. 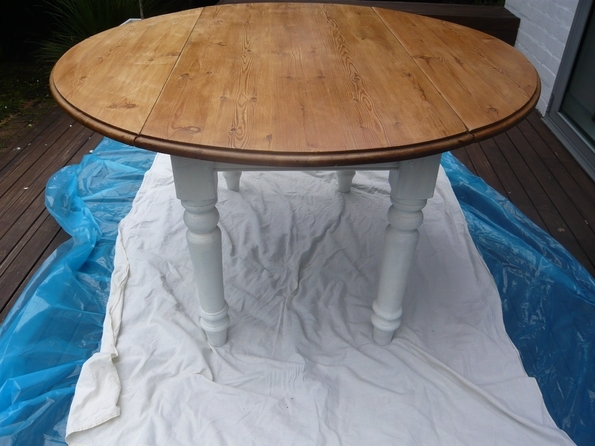 Apply your first coat and allow around 6 hours in between before applying your second coat. 18-24 hours must elapse before applying the specialised finish as seen below. The French wash is really a two person operation if your working on a large area. 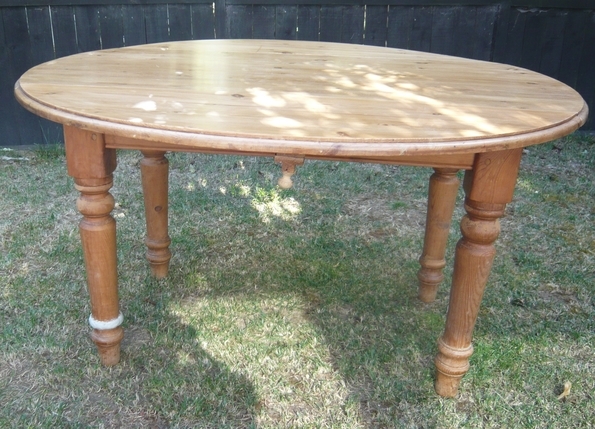 A table such as this is fine for one person as long as you work on one leg or section at a time. 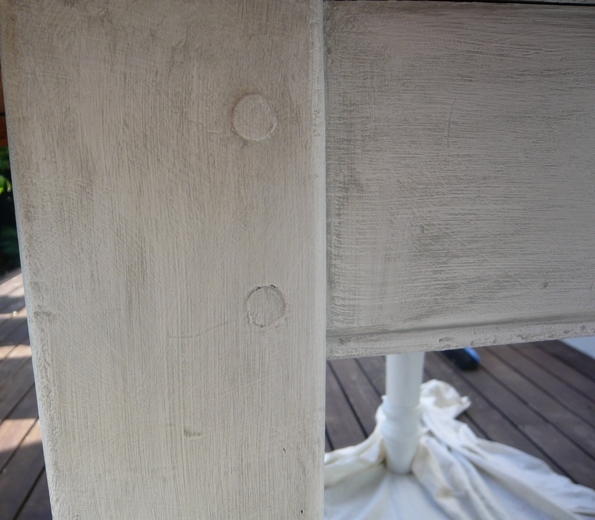 First apply the french wash using a similar flat brush to the undercoat. apply the wash in a random pattern. I actually applied it more in up and down strokes as I wanted this look on the legs.You must apply the product to completely cover the undercoat. Only a brief time after, say 1 minute you then proceed to wipe off the French wash, again in a random pattern depending on the look you wish to achieve. To rag it off you use clean muslin cloth. Dab or roll with the muslin cloth bunched in your hand but make sure you keep using a clean part of the muslin, don't use a part of the muslin covered in the wash when moving to a new area. Continue until you have covered the whole area you have applied the wash. Then start again on another section, apply the French wash to fully cover, wait a minute then begin to rag/wipe off, do not wait more than a minute or it will dry and you will not be able to remove it. If you are doing a larger piece of furniture then you will need someone to help you wipe off while you are applying the wash. If there are two of you make sure that it's the same person who does the ragging/wiping off as each person will have their own technique and you will find the pattern is not consistent. The finished leg once I ragged it. Because I applied the undercoat with downward rough strokes the effect I achieved is one more of lines as the French wash remained in the underneath brush strokes when wiped off. The finished effect I was wanting to achieve. Once this has dried for 72 hours you can apply a sealer or a wax to the wash. I'm sorry this is not a clear photo but it gives an impression of the finished piece. 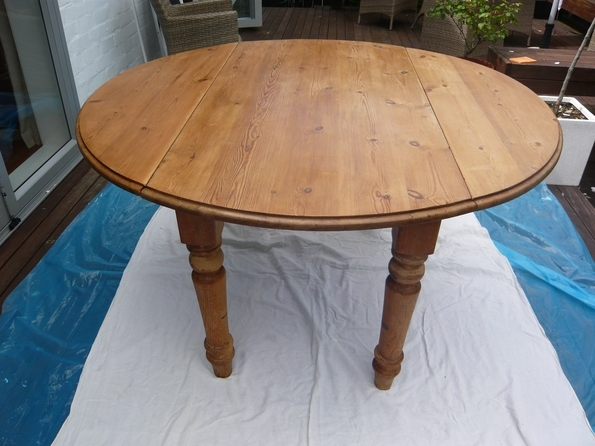 I purposely left the top of my table "natural" pine as I prefer this look. This photo was taken in a big rush and I am annoyed that the bowl off centre, sorry but wanted to get the post up. These two images are from a gorgeous home I have featured previously, please click "here" to see more images. 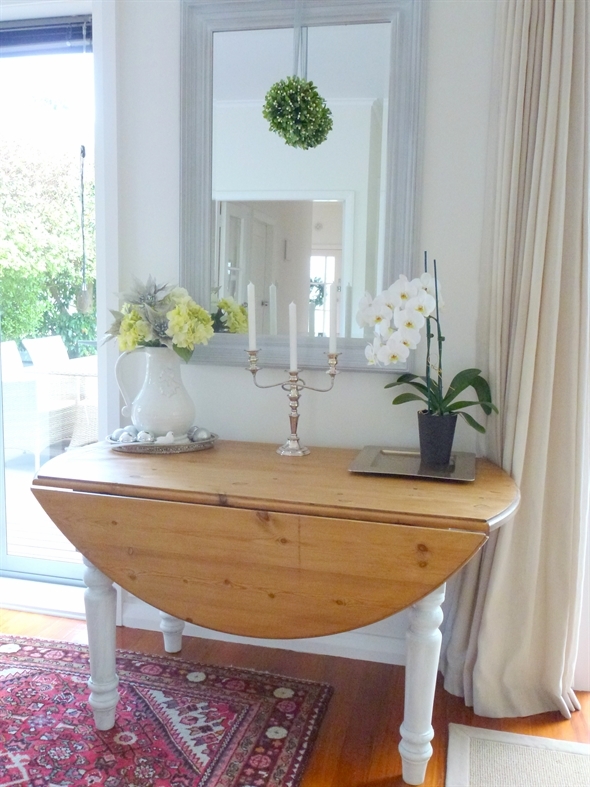 Since publishing this post Chalk Paint™, decorative paint by Annie Sloan, has reached New Zealand's shores. 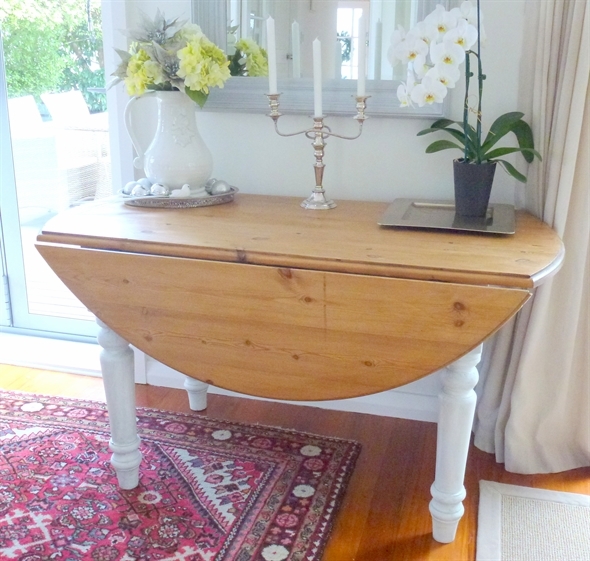 You can see my first makeover using this paint which was a lot easier than the French wash. To see how I achieved this look below with 'before' and 'after' shots...Read more here. I hope you've enjoyed this DIY tutorial, have a wonderful week. Love the inspiration photos, too! Thanks Becky, yes the French wash is a wonderful product, made life so much easier. I am actually going to do another wash over the top although they say not to, I think I didn't cover it enough and want a little bit more depth of colour. Thanks for linking to Time Travel Thursday. I hope you'll join the fun each week. 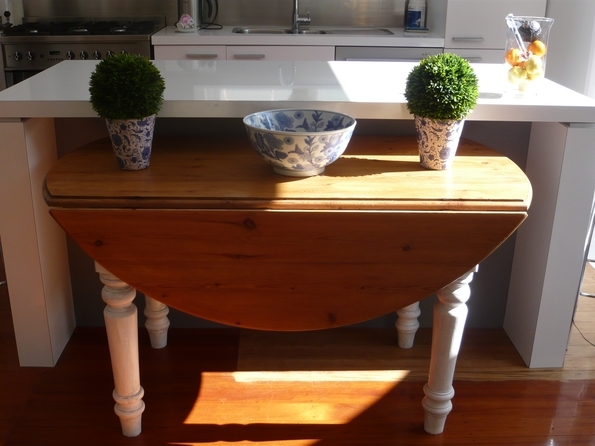 This would work great on a pine dresser, go along to Porters, they're in Anzac avenue, CBD. Take a photo of exactly the look you want and swatches of your room colours as they are so helpful. They will even show you on a peice of card exactly how to apply the finish. Thank you Liz, I am pleased you liked the makeover, I hope your viewers enjoy the link on your page. Hope to share some more inspiration next week. Thanks Vic, my first attempt! I have a cute corner cupboard to tackle next. ..I am so happy to find your beautiful blog.